We are all familiar with the inconsistency of the ATF. The ATF has changed their position on the Sib Brace (SB-15) with a pistol. While the ATF, still states that it is legal to use the SB-15 as intended (strapped to your wrist), they have reversed their position on using the SB-15 when shouldered. We believe that this is the correct decision and interpretation. The problem is that someone else recently asked the same question and got a very different answer. ATF has now stated that the misuse of the SB-15 (being fired from the shoulder) does create an SBR and make the pistol subject to the NFA. FTB has previously determined (see FTB #99146) that the firing of a weapon from a particular position, such as placing the receiver extension of an AR-15 type pistol on the user’s shoulder, does not change the classification of a weapon. Further, certain firearm accessories such as the SIG stability brace have not been classified by the FTB as shoulder stocks and, therefore, using the brace improperly does not constitute a design change. Using an accessory improperly would not change the classification of a weapon under Federal law. However, the FTB cannot recommend using a weapon (or weapon accessory) in a manner not intended by the manufacturer. The Letter that Sig sends with the SB-15 states that it is ok to use the brace as intended and does not create a firearm subject to the NFA. Previously this left many concerned that if someone was to use the brace not as intended an SBR would be created. This letter from the ATF clears up the issue and states that just because an accessory was not used as intended, the firearms is not reclassified by ATF. If you would like a copy of the letter from the ATF for your records it can be downloaded. If you have been thinking of buying an SBR, now is the time to do it before the ATF changes the CLEO requirements. On Monday September 9th ATF will be publishing proposed changes to the CLEO requirements for Gun Trusts and changes are expected after the expiration of the 90 day comment period. I have personally purchased one of these guns and am awaiting approval from the ATF. This special is good while supplies last. Currently there are 1500 units in stock and ready to ship. This is an incredible deal on a SBR for our Clients. 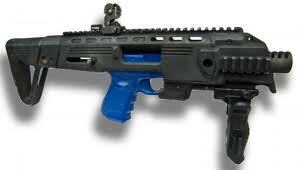 This gun uses IMI Parts ( Israel Military Industries). The IMI parts are M16 Nickel Baron bolt carrier group, Flip up gas block sight with quick deployment points on both sides, 7 1/4 polymer quad rail with QD attachment on the bottom front, MilSpec trigger parts group, Buffer Tube with 6 position stops, buffer, and buffer spring. This SBR is manufactured by GPI in Jacksonville using the GPI 7075 Precision ambi marked lower receiver. Bullet pictograms with save, semi, and auto, black type 3 anodize matching precision 7075 A3 flat top upper, also type 3 anodized. 11.5 inch 1/9 twist, 4150 CMV match barrel with 1/2 x 28 standard threads. Riffle comes complete with 1 IMI 30 round Battle Magazine, This bundle include engraving of your Trust Name meeting ATF requirements, the $999 Price include a Base Gun Trust, and Form 4 for those who pick up from GPI in Jacksonville or Form 3 to your local dealer included. $999 including a Base Gun Trust which can be upgraded to our Advanced or Professional Trust. Up to 10 additional IMI battle Magazines can be purchased for $12 each with each firearm. Place your order by sending and email to sales@gpigun.com or calling (904) 425-2791. One of our clients has gotten the ATF to approve this configuration. With an A2 Buffer Tube it almost makes an SBR unnecessary. Not only does this only have one tax stamp for the Silencer but it has an amazing scope designed specifically for the 300 Blackout. Of course if you want a forward grip you have to add another tax stamp that would be included with the an SBR version. The Burris Eliminator Gen 2 laser scope is around $800. It allows for adjustments to the Laser range and puts the LED dot where the bullet impact will be. We have heard that it is “wicked accurate.”. Revised: Are SBR’s legal in Illinois? Starting January 1, 2013 you will be able to purchase, transfer, make, possess, and use a SBR in IL. At first glance it appears to be very limited and only apply those with a valid and active military re-enacting group membership to use them for military re-enacting. But there is an interesting exception, those with a Valid C & R license can also own them. The Law is poorly written and leaves many questions unanswered. A Gun Trust cannot have a C&R license, but a Trustee of a Gun Trust Can have a C&R license. The question is will ATF allow a Trust to purchase a SBR if all Illinois based Trustee’s (the authorized users) have a C & R License as required under IL law. If not you will still need a CLEO sign off because you can’t have a C&R within a Trust. ATF has stated that a Trust cannot own an SBR in IL (2014). Also, once you modify a C&R firearm it no longer retains its C&R status, but the Illinois law is different than similar laws in CA because if you have a C&R license, you can buy any SBR not just a C&R SBR. Can I Add a Stock or a Folding Stock to a Pistol? While it is legal to add a Stock or a Folding Stock to a pistol, doing so will create a SBR which must be engraved and approved using an ATF Form 1 prior to doing so. In fact, having a stock and a pistol in close proximity with the present ability to configure it as an SBR could be constructive possession of an SBR. If you are planning on doing building an SBR, you should keep the stock in a separate location so that you are not charged with possession of an SBR without a valid tax stamp and approval to do so. While SBRs are legal in many states, they are not legal in all states and you should check to see if possession or manufacturing a SBR is legal in your state.